Depending on your current physique, you’ll need to take different steps to reach your goal. In this video we’re going to address one of the scenarios: How to go from an Average physique to the Greek God Physique. The average physique is a term I use to describe the most common male body: 13-17% body fat with little muscle mass. Most people start their fitness journey from this point. I started from the Average physique as well. The first picture shows is how I looked before I started lifting. One and a half years later I reached the Warrior Physique (middle picture) and one year after that I reached the Greek God Physique. Muscle is a by-product of strength. To reach a certain muscle size you need to hit the strength level that corresponds to that size. Then, to have great proportions, great muscle definition and 6 pack abs, you need a low body fat. Waist circumference around the navel corresponds fairly well to body fat. Having a very slim waist guarantees a low body fat. This is why we set that as the goal. When you reach those standards, you will have the Greek God Physique. Should you Cut or Bulk First? The most common issue people have starting from the average physique is that they’re unhappy with both their size and definition. These are the guys that ask the famous question: Should I cut or bulk? They would like to get bigger and leaner at the same time. Start with a cutting phase. Lose body fat until your waist reaches about 45% of your height (for example at 6 feet tall you’d want a waist that is 32 inches around the belly button). Depending on how much fat you have to lose, this cut can take anywhere from 3 to 10 weeks. When your waist reaches ~45% of your height, move into maintenance for 2-3 weeks. After the maintenance phase, start eating more and focus on muscle growth. This lean bulk should be stretched over several months to maximize muscle gains and minimize fat gain. Once you’re up to 14-15% body fat (waist is about ~48% of height) it’s time to cut back to the 9-11% range (waist is ~45% of height). Ideally, as you’re gaining size you’ll never go above 15% body fat again. Your cut and bulk cycles will be kept in the range of 8-15% body fat. This way you’ll have good muscle definition all the time (or at least a 4 pack) and your face will stay angular. Repeat this process until you’ve built enough size to have the Greek God look when you cut down to 8-11% body fat. I know a lot of people will argue against starting with a cutting phase as you will end up looking too small. They’re right. In the first few months you will look very small. But it’s worth it is because as a beginner, you will also gain muscle very well while losing body fat. At the end of your cut you will be smaller, but you’ll be ripped. Also, by losing fat first, you can then stay in a calorie surplus for a very long time without getting too fat. After your first cut and 2-3 months of lifting you end up at what I call the Base Level. You are around 10% body fat, you can do 8 body weight chin-ups and you can incline bench press 90% of your body weight for 5 reps. This is the starting point for either the Warrior Physique or the Greek God Physique. To get there from the average physique, you need to lose 5-10 pounds of fat and gain 5-10 pounds of muscle. If you’re just getting started you’re probably confused about how to lose belly fat and gain muscle. I understand. I used to think high intensity exercise, low carb diets and cardio were the reason we lose body fat. I also thought confusing your muscles would get me bigger. The truth is fat loss all comes down to being in a calorie deficit. And muscle growth comes down to getting stronger. If you track your calorie intake directly and make sure you’re in a deficit you can lose fat playing on your phone instead of doing cardio. For fat loss you should eat between 10 and 13 kcal per pound of body weight everyday. Those that are very active (manual labor + weight training and sports) should use the top range of the interval (13 kcal x bw in lbs). For example someone who works a desk job, doesn’t do cardio or play sports and works out 3 times a week should set their calories at 11 per pound of bodyweight. Also, to support muscle growth, you must make sure you include around 1 gram of protein per pound of bodyweight in your daily intake. This is important. Getting enough protein in your diet makes a huge difference for muscle growth. If you stay in a calorie deficit for 4-10 weeks and get around 1 gram of protein per pound of bodyweight, you will be able to lose body fat, while also gaining muscle. When you want to build muscle, the main goal of your workouts should actually be getting stronger. Most people don’t understand this, but we can’t train for size. Muscle grows either to produce more force (increasing the size of the contractile tissue so it can lift heavier weights) or to improve endurance (increasing the capacity to store fuel known as glycogen around the muscle fibers). Increased muscle size, is a side effect. Most of the muscle mass a natural lifter can gain will come from getting stronger in the 5-12 rep range. That is because lifting heavier and heavier weights over time increases the actual size of the muscle fibers. Doing a lot of light reps will only lead to a small amount of muscle growth. That’s because after your glycogen stores have increased enough to handle that volume, there’s no more reason to grow. What this means for you is that the routine that will get you strongest in a medium rep range will also be the routine that will give you the largest increase in muscle mass. Training is done three days per week, on non-consecutive days, alternating between Workout A and Workout B, like this: Monday: Workout A, Wednesday: Workout B, Friday: Workout A, Monday: Workout B, Wednesday: Workout A, and so on. Rest three minutes between sets for the compound movements. Rest 60-90 seconds for the assistance exercises. When you hit the required reps for all sets, increase the weight on all sets the following workout. This will probably cause you to lose 1 or 2 reps in the last 2 sets. That’s normal and the goal for the following workout is to add back the reps in those last sets so you can increase the weight again. After 1-3 months of cutting and lifting you’ll be at the Base Level. To reach the Greek God Physique you now must focus on gaining weight in addition to gaining strength. You’ll now shift your focus on maximizing muscle growth by lean bulking. To do this you’ll eat a slight calorie surplus (5-10% above maintenance) for long periods of time. As you’ll gain strength on the key movements you’ll also build muscle and size. For most people, the process will take around 2 years. A lot of guys get discouraged when they hear that and I think they miss a VERY important point. You won’t go from your current physique right to your goal physique. It won’t be like: fat & weak, fat & weak, fat & weak, and on the 730th day you’ll wake up looking awesome. No! You’ll gradually look better as you’re progressing towards you goal. This is the reason why we need to stay lean while building muscle. To keep our motivation high and enjoy our fitness journey, we should start out looking good and end up looking great! You need to stay under 15% body fat all the time. Your cut and bulk cycles will be kept in the range of 8-15% body fat. You’ll inevitably gain some fat as you’re gaining muscle so once you’re up to 15% body fat it’s time to cut back to around 10% range. You’ll repeat this process until you reach the Greek God Physique. This program lays out exactly how to go from the Base Level to the Greek God Physique. It’s the training and nutrition program I’ve been following for two years. i Radu i am 184 and only 69 kg and i am around 16 % body fat. As you say in the article you recommend cutting. But don’t you think my weight is too light to cut ? Also i have been training for 1 years and went from 56kg to 69 kg. Yes, 69kg is too low. You can do a lean bulk instead. 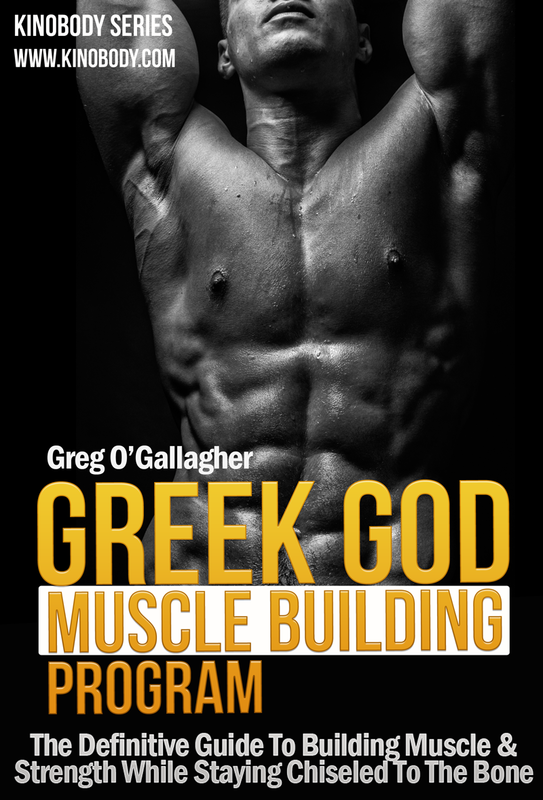 Just bought the Greek God program and the Goddess program and for the greek one it says that you can achieve the body you want in 4 month.. Then i went on internet and found your article and it’s a bit confusing in my head.. For example, for the greek program, for my boyfriend, there is the recomp protocol where Greg explains that you can loose fat and gain muscle in the same time, by only adjusting calories on your lifting days. It also says that you should start with 15cal per pounds per day for the maintenance calories and from there you adjust how much you eat per day. My boyfriend has 82kg,182cm and 21 body fat and he wants to get to 85kg muscle. Can it be achievable with the recomp protocol? As for myself, i have 63kg, 172cm and 28 body fat (a little bit, i know :p ) and would love to have 65kg with muscle. It’s not the same the Goddess program, but it says eating 14cal per pounds for women also. 3 days of weight training and wat about cardio? seperate days for cardio or post workout? Se dezvolta tot abdomenul? Adica tot 6 pack-ul?Mersi ! Da, de obicei nu e nevoie sa faci abdomene daca faci acele exercitii. Strength usually comes first, you’ll notice the size gains over the next few weeks. If you’re no longer a beginner (you’ve made your neurological strength gains), your bones and joints have adapted to training and your form is efficient, if you’re gaining strength, by definition you’re also gaining muscle. hey Radu, thanks man! great info. I had a doubt- By ‘bodyweight’ do you mean target bodyweight or my current body weight. plz elaborate with an example. I’m about 100 kgs at 5ft 8in .what should I do? plz reply! Amazing article man, just read and started to apply your “Path to your Goal Physique.” Just wanted to say keep the good work up! Hi Radu, so i have a question. Should we keep eating that surplus of calories if we are on (not gym days) like (saturday,sunday)? Yes, your body is recovering on those days. Hi Radu,i have a question. Should we keep eating that surplus of calories if we are on (free days,no gym days) like (saturday-sunday) ?? Nice Work both of you at Kinobody Greg and Radu at Think.Eat.Lift, agreat work keep all the best in the future i will be starting aggressive fat loss 2.0 program soon, i have been lifting on and off from 4 years its like i will train 3 months stop coz (busy with work) life etc. For a few months even 6 7 months than start again train for 4 – 5 months and stop then 2 months and so on. Recently i am training for last 2 months doing intermittent fasting and wating at 15% deficit and have got great result from waist 38 i went down to 35 my arms are 17 inches i can see my biceps hump up but so defined. I plan to go fown to waist 32 Btw i am 6’1″ 208 lbs i think 18% – 21% body fat i think not sure. I train 6 days a week weight for 4 Days and Hiit for 2 days. Any Advice? I’m sort of stumped on what to do next. I’m reading your path to a goal physique but I’m more of a skinny with decent muscle kind of build. Should I cut for summer or do a lean bulk? Hey Radu ! Recently discovered your website and your YouTube channel and it’s amazing. You have earned all my respect and I wish you the best. I read your website and heard on one of Greg’s videos that a man should never drop below 1800 (or 1600) kcal a day. But I’ve done much worse as I currently am on a 800 kcal intake per day. It’s really not that hard and I don’t feel sick. Just hungry and a little frustated (but not that much). I’m not about to break my motivation any time soon, it’s really not the hardship that bothers me. Many people believe it is inevitable, that by some kind of dark magic I WILL regain every single kg I painfully lost. What can I do to maintain this loss and not be fat again ? I assume that I can’t go back to my 2300 kcal diet directly… I’m lost ! I just want to add that I don’t do any type of working out, I just did a lot of cardio to be sure to burn most of what I eat, and I intend to start working out when I’m finally thin. I’m 74kg for 1m74 now, started from 84 and I wait until I’m 65 (around 9% body fat) to finally start lifting. I really don’t want to waste all this effort. I really need your advice on this problem, man. I’d be very thankful. Keep up the amazing work ! I look forward to reading your answer and I thank you for that ! Cya, from some Frenchie in Paris. I only recently discovered your youtube channel which is very useful, motivating and funny. Being 41y.o. workout out since my 16th, I guess I have a lot of experience. For the moment at 172cm, 69kg en BF% 13-14. Like everybody I want to get ripped more and gain lean muscle mass as well. I have been in the past bulky: 82kg with a lot of fat on top. Now is much better. Still I want to reach less than 10%BF. I am cutting calories with an iPhone app since 1 year, works out very well for me. I follow you completely saving most calories for the evening and so on. Some controversial info (which I believed in for many years) confuses me though. Good stuff, postponing first meal, saving most calories for the evening, etc. -I have believed a lot of stuff written on t-nation.com all about the importance of peri-workout nutrition… Do you really not believe this? They are talking about cutting back and eating enough to build muscle. What is your opinion? I saw your movie on “not taking supplements”. I’ve had periods taking none, periods taking all kinds. Surely creation, vitamins and minerals are useful. = still more confusing info… what is your opinion? As you can read, after many years of dieting, working out, trying all kinds of supplements, I still am confused about a lot of the info. Still I am a scientist man myself and realize we should listen to the (meta)studies. Wish we could discuss a lot of more issues with one another. I have a question for you. I weigh about 150 lb, and eat about 1500 calories a day (I am vegetarian), using intermittent fasting, but I don’t really see any weight loss though. What should I do? I am a teenager and I was wondering how to cut and fast while getting enough nutrients to grow. After I have lost 20 pounds I have not been growing and struggled with my fat loss. I cut 200 kcal every day, eat very lean(no processed foods, sugar or any junk), but yet I don’t see results and not grow. I am at 15% body fat. What should I do? Hey Jeff, you should track your calories and make sure you’re in a deficit. I’m 40 years old, 182 cm tall, 69 kg, 48% waist. I’m at ~12-13% BF. I have started to cut a month ago with 71 kg with ~ 15% BF, following the beginners routine from GGP. I was thinking to cut below 10% and then following your advice, stay in maintenance for 2 weeks. But this, for sure, will take me to ~66-67 kg. Can you, please, advise if starting the lean bulk from 66 kg, following GGP beginners routine it will be ok? Question: I’ve been losing lots of weight, but my belly is still 38 in, but I’m only 180 lbs. How much will I weigh at 11% body fat? Found your YouTube channel (while checking for Kinobody reviews) a month ago and I have been binge watching all your video’s. Great job man! Question: I have been cutting the last months from 90kg to 82kg with a (1×6) 75kg incline, 80kg bench and 1×6 bw+28kg chin ups. So while I’ve maintained most of my strength I keep hearing from others that I am starting to look small (even my mother and GF says it now). My waist is 42,5% of my height (82 cm of 1.94cm height) but I’m not at 10%, I think about 13% bodyfat. What would you recommend? Should I do a bulk or keep cutting even though 82kg bw @ 194cm height is already pretty small? Love to hear your thoughts, greetings from Holland. Hi Radu, I recently found out about your channel and I really like your videos, they’re the most informative videos on fitness I’ve seen yet. I am currently 150 lbs with a warrior physique, but I’d like to bulk up to reach the Greek god physique but I’m confused on how I should lose body fat for when I bulk up. For example, if I wanted to lower my current body fat, according to what you said, I should be eating 1500kcals (1500 calories)/day to lower my body fat %, but isn’t that too low to not be hungry? I have no interest in obtaining the Greek God physique. I’m more interested in the warrior physique, finding it more attractive looking. What is the process for achieving that? 1. For bicep curls – According to the GG strength standard, I need to be curling 110lbs. I’m assuming this is a barbell and not per dumbbell? 2. If I’m using dumbbells for bench, shoulder press, and curls is it fair to cut the weight in half per arm or would the percentages be different for using dumbbells? 3. How do you measure waist? Is it relaxed and around the belly button? Relaxed and around the narrowest part? Sucked in? I’m skinny fat and hold the majority of my fat around the belly button and love handles. However, I have a bit of abs showing above the belly button. 4. How do you measure arms? Is this unflexed or flexed? 5. 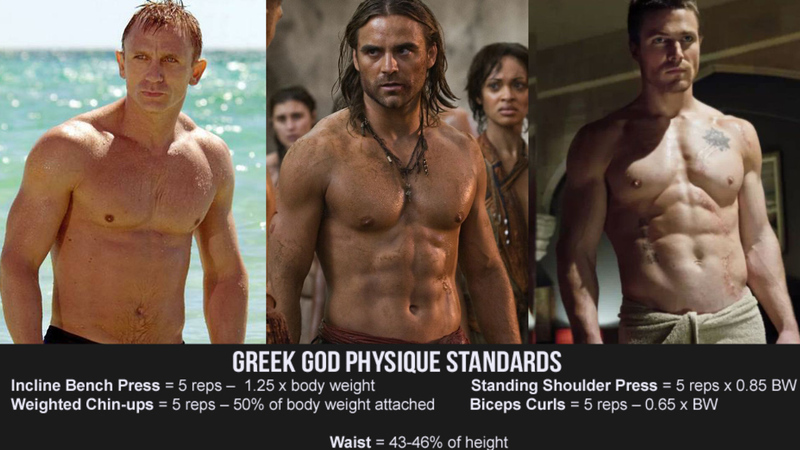 Are there any equivalent bodyweight strength standards for the warrior physique and the greek god physique? Hi Radu, I’m a 20y old lady. Can I lose body fat without a gym, without lifting? Only body weight exercise… I try to push myself and it usually takes 1 or 2 hours. I take pretty long rests and do a variety of things combined trying to matain a good heart beat. I mix yoga and body weight exercises with active cardio rests in between. hey radu! I’ve been lifting for 2 years now. I’m 1.74cm 68kg around 16-17% bodyfat. Last year i did a cut and went to 10%BF but i messed up while bulking. I gained 7kg but i think it was only fat. Should i cut again to 10% and start a more carefull bulk? I was wondering for a man170 cm height aproximatly how much muscle is requiered to gain from 9% body fat after being slim fat to reach greek god physic, around 20 kg of muscle? Would Tom Hopper from black sails be considered a warrior body or greek god body? i have a question though… should i eat the number of calories according to the weight i started in? or every day according to the weight i am currently in? I really want to achieve greek god program and make my abs killer visible.